Is the Grand Prix Attack Busted? In today's chess world, not many will debate the fact that the Sicilian Defense is one of the most feared fighting weapons against 1.e4. 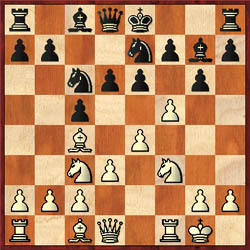 The counterpunching 1… c5 gives rise to many different lines, some carry names such as: the Najdorf, the Sveshnikov, the Kalishnikov, the Dragon, the Paulsen, and the Scheveningen to name a few. The problem is there are so many transpositions and variations to study that it becomes difficult to keep up with well-prepared lines. Over the last 40 years, the success of players such as Mark Taimanov, Bobby Fischer, Garry Kasparov, Viswanathan Anand, and Peter Leko has caused the player of the white pieces to scramble for solutions to the dreaded defense. The recent trend has been to avoid prepared lines with "Anti-Sicilian" measures. Some of the most popular systems are the Rossolimo (3.Bb5 or 3. Bb5+), the Alapin (2.c3), the 4.Qxd4!? line, the Smith-Morra Gambit and the Closed Sicilian (2.Nc3). While these approaches are often criticized for their lack of punch, each of them possesses their own dose of venom and could cause problems for the unsuspecting black player. One such line that gave black trouble early on was the "Grand Prix Attack," or GPA. This is characterized by a lightening attack against the black king and is noted by moves such as 1.e4 c5 2.Nc3 (2.f4 d5!?) e6 3.f4 Nc6 4.Nf3 d6 5.Bc4 (5.Bb5!?) g6 6.0-0 Bg7 7.d3 Nge7 9.f5!? (diagram) with the idea of checkmating the black king. White can also opt for 9.Qe1 and 10.Qh4 followed f5, Bh6, Ng5, rook sacrifices and checkmate, if black dares to castle. Anyone who has been on the receiving end of a GPA will attest that the results are not pleasant when white gets the typical attack formation. English players rolled up a huge plus score (during the English Grand Prix league) before Sicilian devotees found a remedy. Thus, the GPA is rarely seen at top level play where only GM Sergey Tiviakov remains its top employer. The GPA still enjoys wide popularity at below-Master levels, but black generally has naught to fear. In the featured game here, Tiviakov trotted the GPA against GM Garry Kasparov and was dissected rather crudely with a recommended setup for black. IM-elect Stephen Muhammad provides annotations to this thrilling battle.